Family travel is all about value these days - and budget-friendly family resorts in fantastic locations are always the hardest properties to find. The Family Travel Network's staff constantly scours the globe for these superb family vacation treasures and we just found a new one in Costa Rica. The Flamingo Beach Resort & Spa is a value-oriented family vacation gem. The hotel's amenities, outstanding beach location and extensive adventure excursion options make it an excellent choice for family vacations with kids of all ages. The 120-room Flamingo Beach Resort & Spa is a modern, horseshoe-shaped hotel complex designed around a large central pool area. The property has just completed the second phase of a $6 million renovation program, which included redesigning the hotel's public areas and updating all of the resort's spacious guestrooms with new furnishings, flat screen televisions, flooring and safe deposit boxes. Families will particularly like the resort's Studio Rooms and Ocean View Terrace Suites with their full kitchenettes, double beds and sofa beds. The Ocean View Terrace Suites also provide a separate bedroom and spacious living room along with expansive outdoor sitting areas with pool and ocean views. The resort’s standard pool and oceanview rooms are also bright and airy. 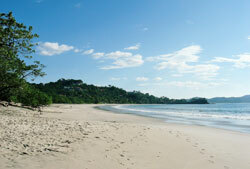 The resort is located along the glistening sands of Playa Flamingo on Costa Rica's north Pacific Coast. Awarded the coveted Blue Flag certification by Costa Rican authorities, Playa Flamingo’s long crescent strand has been ranked as one of the best beaches in Costa Rica based on its water quality, high ecological standards, visitor conveniences, and strong community commitment to keeping the beach clean. The resort sits right across a narrow dirt road from the best section of the beach, providing good ocean access and spectacular sunset views. This unspoiled section of beach provides gradual water entry and the waves are usually good for both swimming and boogie boarding. Tidal pools perfect for exploring can be found to the right, while good surfing for older kids and teens can be found down the beach to the left. Since Flamingo Beach Resort was built by a family and designed for families, the property has a number of special features parents and children love. The large pool is beautiful lit at night and the attached shallow "kids" pool is completely covered by a large palapa to keep kids - and even sun-sensitive adults - protected from strong solar rays. Avid sunbathers will be thrilled with the pool's interior decks complete with lounge chairs - perfect for those working on their tans. There’s an attractive outdoor play area next to the pool as well as a children’s center, and the nearby swim-up Mangalles Pool Bar serves a tempting array of fruit smoothies and drinks as well as casual lunch fare. Flamingo Beach Resort has an enthusiastic activities director and a daily program of fitness training, classes, tournaments, children’s activities and events. Families who enjoy pool games will be thrilled with the resort’s “picina de juegos,” a smaller pool on the side of the hotel that's perfect for relaxing or an invigorating game of volleyball. Spectators can watch from the nearby covered "rancho" which can also be used for resort activities. The resort also has a billiards area off the lobby with complimentary pool tables and a lighted outdoor tennis court. The resort’s activities director offers kids’ tennis clinics on request. Fitness buffs will want to visit the hotel’s new state-of-the-art gym, located on the second floor of the lobby. Also on this floor is the hotel’s new library/board game room with Internet access. Watersports are plentiful at Flamingo Beach Resort and both customized sport fishing packages as well as the full-service Pacific Coast Dive Center are conveniently available at the property. Hotel guests have a variety of dining choices from which to choose. The resort’s Arenas Restaurant and Terrace serves local and international fare for breakfast, lunch and dinner. Guests can eat indoors in air-conditioned comfort or enjoy their meal and the surrounding tropical scenery under the restaurant’s outdoor open-air palapas. The rooftop Bar Arenas on the second floor provides panoramic views and is a lovely spot to watch the spectacular sunsets. Flamingo Beach Resort also offers all-inclusive plans, which are often popular with families. Off-property dining options are plentiful and several are within easy walking distance of the resort. Some of the best restaurants in the area include Angelina’s Restaurant, Marie’s, Mar y Sol, Camaron Dorado and the Happy Snapper. Babysitting services can be arranged for parents who would like to enjoy a romantic dinner out on the town, perhaps followed by a evening of fun at the resort’s newly renovated casino. Flamingo Beach Resort guests can also enjoy being pampered at hotel’s new Serenity Spa. The spa’s licensed, highly trained therapists offer a full range of massage, body and facial treatments using organic, natural products. The spa’s 80-minute Aromatherapy Massage and the 80-minute Costa Rican Lava Rock Massage are both heavenly. The resort offers several spa packages. Make sure to visit the hotel’s website for available offers and ask about current spa specials at time of check-in. Flamingo Beach Resort’s outstanding location is comprised of so much more than its long and luscious stretch of beach. The property sits within easy driving distance of an extensive array of adventure and eco-destinations that will keep every member of the family wide-eyed with excitement. Fiery volcanoes, adrenaline-pumping zip-lines, indigenous Indian cultures, jungles filled with monkeys and colorful birds, volcanic mud baths and natural hot springs – they’re all waiting here for families to discover. The resort’s on-site Tour Desk can help make arrangements for a variety of family-friendly excursions. Many families enjoy taking a leisurely boat ride along the Tempisque River through Palo Verde National Park. Curious monkeys, large green iguanas, basking crocodiles, and a variety of exotic tropical birds can often be seen along the river. This is a very popular trip, so make sure to make your reservations early. Another family favorite is the full-day combination tour to Arenal Volcano and Tabacon Hot Springs. Arenal Volcano is one of the most active volcanos in the Americas, and is well worth the trip. On the 3 ½ hour journey to Arenal, guests stop along the way for lunch, a rainforest hike and a visit with members of the indigenous Maleku Indian tribe who live in the region. You may even see some curious wildlife along the way. After arriving in the Arenal area, take a soak in the soothing waters of Tabacon Hot Springs and view the Arenal Volcano in both daylight and after dark. Clouds often shroud Arenal during the day, but after dinner, our group was treated to a fiery nighttime display of volcanic activity. Families with teens will enjoy the Buena Vista Hot Springs Canopy Experience and Water Slide. This long day tour provides one adrenaline rush after another. It starts with an exciting zip-line adventure through the jungle canopy, followed by an exhilarating trip down a long water slide, horseback riding, a natural mud bath, and a dip in the hot springs. Lunch is also provided on this tour. Those who would prefer their adventures closer to home should take the 25-minute ride to the little surf town of Tamarindo. Spend the day here relaxing at the beach, taking surf lessons, exploring the many shops, and having a leisurely lunch at one of the beachfront restaurants. Local operations like Costa Rica Surf Club, Iguana Surf and Kelly’s Surf Shop offer surf lessons, rentals, and lots of helpful information. Families visiting Flamingo Beach Resort from November through February may have the opportunity to witness one of Mother Nature’s most spectacular events, the nesting and hatching of highly endangered leatherback turtles at Las Baulas National Park, often referred to as Playa Grande. If you’re interested in this activity, check to find out how turtle season is going this year and at what time turtle viewing may be likely. Reservations are required and can be made by phone up to one week in advance. Participation is limited to 60 people per night, so it is very important to make your reservations early, especially in the prime nesting periods of mid-November through early February. Whatever you do, don’t miss being on the beach at sunset. Every evening serves up a different kaleidoscope of colors and surprises – each more magical than the next. So gather up the kids and take them down to the beach as the sun melts into the sea. If you’re lucky, you might even see the green flash! * For more information about the Flamingo Beach Resort & Spa or to make reservations, visit www.resortflamingobeach.com or call 011-506-2-654-4444. 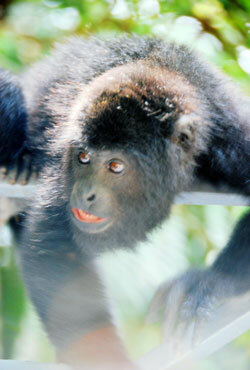 * Costa Rica’s peak season – the dry season - usually runs from mid-December through the end of April. 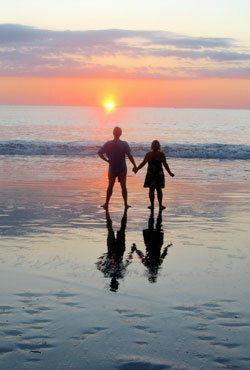 Off-season rates during Costa Rica’s “green season” provide exceptional family values and are generally available from May through early December. Although Costa Rica’s rainy season occurs during this time period, Guanacaste, where the Flamingo Beach Resort is located, is one of Costa Rica’s drier regions year-round. 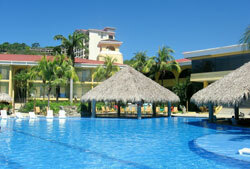 *Flamingo Beach Resort & Spa is located within a 45-minute drive from Costa Rica’s Liberia International Airport. Transfers are available through the resort or families can rent a car at the airport. * Playa Flamingo is a lovely, unspoiled beach and there are no lounge chairs, umbrellas, or beverage services offered there. If your family plans to spend a lot of time at the beach, you may want to bring a lightweight beach blanket along on your trip. Flamingo Beach Resort provides beach towels and plenty of lounge chairs are available around the pool. * Turtle nesting season at Las Baulas generally begins in November and runs through February. For more information and to make reservations, contact Parque Nacional Marino de Las Baulas (Playa Grande) Tel: 011-506-2-653-0470. Participants are not allowed onto Playa Grande until a turtle is sighted and small groups are sent out to the beach in the order in which registrations were made. Currently, a $25 fee is charged for each individual allowed to go out to the beach to see a turtle. Make sure to inquire about current procedures and fees. Bring along a book or card games for entertainment while you wait. More information about the leatherbacks is available at: http://www.leatherback.org/ldc/pg/park.htm. * There is a small souvenir and convenience shop at the resort. A wide variety of souvenirs is also available at many of the shops in Tamarindo, as well as at the Sea Star Gift Shop in Brazilito and La Gran Nicoya near Liberia International Airport.